If you’re looking for a little bit of culture this spring, we’re pleased to report that there are some great exhibitions in Leeds, offering something for everyone from the worlds of cinema, pottery, crafting and much more. Here’s our pick of what’s on offer for the eager culture-vultures among you! We’ve heard of one-a-day photography projects, but this from Anna Whitehouse takes the idea to a whole new level. Creating a clay bottle a day for 100 days in a row may seem crazy, but Anne felt that it would free up her creative process and allow her to quickly explore new ideas without getting stuck. You can see the results at the City Art Gallery until 20th April 2019. The Tetley may be on the edge of the city, but this amazing film installation by Kannan Arunasalam could be one of the most important exhibitions in Leeds in 2019. Focusing on Sri Lanka’s civil war, the exhibition will feature a new production, The Tent, alongside many of his existing short films. The Tent highlights the struggles of a group of mothers and daughters of missing soldiers who camped outside the government buildings to protest the war. The Craft Centre & Design Gallery at the City Art Gallery hosts this fantastic exhibition of Irish linen prints by Gail Kelly throughout spring and summer. Gail’s work is magical, lighthearted and shows the skill of a true print expert. Her inspiration comes from old traditions, myths and legends, and she uses these stories to weave together woodcut and linocut printed linen into pieces of art that tell delightful stories. Renee So’s sculptures and textiles are tough to define, featuring a host of influences from around the world and through the ages. Heavily influenced by 16th and 17th century bellarmines (ornate stoneware vessels for transporting food and wine), her sculptures look like abstract and fragmented parts of old men. You can check out her work up until 2nd June. 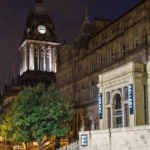 We hope that you find the time to visit some of these interesting exhibitions in Leeds this spring, and take advantage of our culturally vibrant city.